During the 2014 Victoria Day weekend, the Canadian Civil Liberties Association (CCLA) and the John Howard Society of Ontario (JHSO) jointly released 2 reports on police record checks. 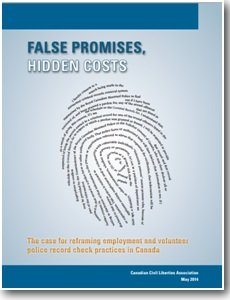 The CCLA report “False promises, hidden costs: the case for reframing employment and volunteer police record check practices in Canada” looks at private and not-for-profit employers and organizations that request non-conviction information as well as third-party companies that provide background check services. The JHSO report “HELP WANTED*: Reducing Barriers for Ontario’s Youth with Police Records” focuses on youth and youth employment and how young people with police records are excluded from the labour market resulting in stigma. CCLA also hosted a discussion, emphasizing that its report does not include countless stories of individuals, including those with mental health issues, impacted by the release of non-conviction information. You can listen to some of these stories online including one about a couple – John and Jane – whose daughter was taken to hospital by police under the Mental Health Act. You can also sign the petition calling for a stop the disclosure of non-conviction records on police checks and for the establishment of a centralized vulnerable sector screening process. CMHA Ontario is concerned about the release of non-conviction records because these can include police contact as a result of an apprehension under the Mental Health Act as well as charges that are withdrawn or stayed because of a mental health court diversion. CMHA Ontario applauds CCLA and JHSO for their recommendations in these reports and continues to advocate for this issue as Co-Chair of the Police Record Check Coalition (PRCC). The PRCC is a group of organizations and stakeholders comprising health law and human rights legal experts and representatives from the CCLA, JHSO, the Ontario Association of Patient Councils, and the Schizophrenia Society of Ontario. For more on police record checks and to read the CCLA report, visit the CCLA website. To read the JHSO report, visit the John Howard Society website.